Nathan Burchfiel from the Center for Media and Culture. Topic: The Craigslist Adult Services section takedown. Ira mentioned this story on the topic by Nathan Burchfiel’s associate, Alana Goodman. Remember the “please rob me” and the “i can stalk you” sites designed to point out the folly of broadcasting your whereabouts? The petty criminals have discovered the target-rich environments provided by Foursquare, Facebook, Twitter and others that have an integrated location-based service. Read more here from the New Hampshire Union Leader newspaper. Is a Cyber Jihad group linked to ‘Here You have’ worm? An appeals court in Virginia upholds warrantless GPS tracking of criminal suspects. The issue has been appealed three times, with different outcomes. The D.C. Circuit Court decided against law enforcement, and San Francisco’s Ninth Circuit recently upheld it in a decision that drew a blistering dissent. Supreme Court in 2011? Probably. Will Andriod will replace Windows? One Security Start-up is betting the farm on it. Law enforcement in North Carolina wants to rifle through your medicine cabinet, virtually speaking, as the sheriff requests access to a state database of prescriptions. Adobe Reader zero day attack contains a scary new booby-trap impacting all computer users. A new survey by anti-virus maker Norton examines the emotional impact of cycbercrime, calling it a “silent epidemic” that’s affected two-thirds of internet users around the globe. The cybercriminal shopping list… it’s not that expensive to get into the business. After upgrading her business computers, Claire wants to know if she can continue to use her old clunkers safely for web-based activity. Ira recommends LinuxMint.com, or VectorLinux.com. Robert wants an alternative to Adobe PDF products. Adobe PDF Reader and Acrobat alternatives: Foxitsoftware.com , CutePDF.com , and gPDF. For those who don’t wish to tackle problems alone, Ira recommends Friendly Computers of Reno. They come to your home or business, and they also do support via remote access. They listen to our program, so they know what we’re recommending. Why call a geek when you can call a friend? See how enter to win a dual-boot friendly netbook, compliments of Lightwave Security, visit The CyberJungle Expert’s Guide. This weeks program: Payroll and card processor data breach – a new trend? Exclusive interview with the developer anti-theft and data recovery program for the Blackberry . Plus, the latest data security news. –> Stream, subscribe or download Episode 33 – Listen or subscribe to the feed to automatically get the latest episode sent to you to your Google, Yahoo, iTunes, or other popular sites. This week’s show is sponsored by The Engate Hosted eMail Security System. Traffic Enforcement Cameras: Teen hackers are attacking an integrity vulnerability in traffic enforcement cameras in Maryland, to the detriment of innocent car owners. The teens create a fake license plate, tape it over a real plate, and then drive in a manner that triggers the traffic enforcement cameras. In a related story, many of these cameras focus on the driver’s side of the car… here is another integrity attack using a right hand drive Audi. 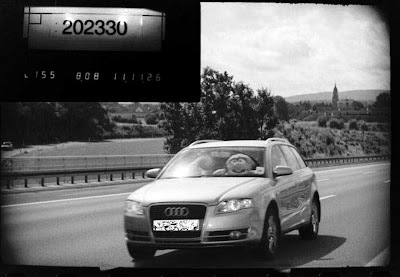 The owner has placed a Muppet in the left front seat of a right hand drive car (see photo above) and has obfuscated the plate number. At least in his case, tickets are not going to other drivers, as they are in the Maryland attack. The BBC has been covering the exploits of a new generation of teen hackers. These hackers don’t seem to realize that their exploits (both digital and in RL) cause innocent people the loss of life savings. Take a look at this informative BBC News video on how teen hackers are using social media sites. EXCLUSIVE: Ira talks with Dan Shipper the Founder of Convenience Software about their newest anti-theft and data recovery program for the BlackBerry – Get It Back. The application has some interesting and useful features, like using GPS to locate the device, making the device play a message like,”This BlackBerry has been stolen,” and the ability to withstand a SIM chip swap. The software still needs some improvement. For example, there is no secured log-on for the web administration control panel. As with all security software: Caveat emptor.